Those who have no Imam, their Imam is Shaitan.Alhamdulillah, we are happy with what we have. “La nu farriqu baina ahadin” (Quran 2:285) these are the words of Allah. Don’t make Imams dispute. Don’t make them unhappy. From you, make Imam happy with you, or it is all difficult, all fitna (corruption). Satan is messing up everywhere, just he is confused now.He is over burdened. Sit down,May Allah not leave us to Zalims (corrupter s)and make us neither Zalim (corrupter) nor Mazlum (their follower). Be neither Zalim nor Mazlum. Quickly,Insha Allah an order will descend from heavens and when he will be told: “Appear” and he will. Imam Al Mahdi (A.S), he is looking for that order from heavens and waiting for the command from heavenly beings to come out.And he has been dressed with power on himself. No one can touch him. If touching him make you like this (Mawlana Showing his fingers bend) , his Takbir (glorification of Allah), Allahu Akbar, Allahu Akbar, Allahu Akbar…whole world become flat…that is he. Insha Allah we will be accepted as small servants. But when he is making Takbir,technology, ships will not sail, you can’t be able. Every machines that is giving so much courage to people, for that reason, will be closed down. The planes will not fly. The Arab lands, no flying.Their navies can’t move, their tanks can’t move, their missiles, Never, Never. And also,their artillery, only swords , nothing else!. With the first Takbir of Imam Al-Mahdi (his first saying of Allahu Akbarr-God is Greatest) the technology will have it’s head cut. In Syria there are saying, for example,Syria closed, it’s sky closed up. So no one can see such things, or no one hearing or seeing, finish!. If that small, very small power, now technologian people using it. At that time, also everything that they are knowing,can’t be able to do anything. Finished! Only swords can. 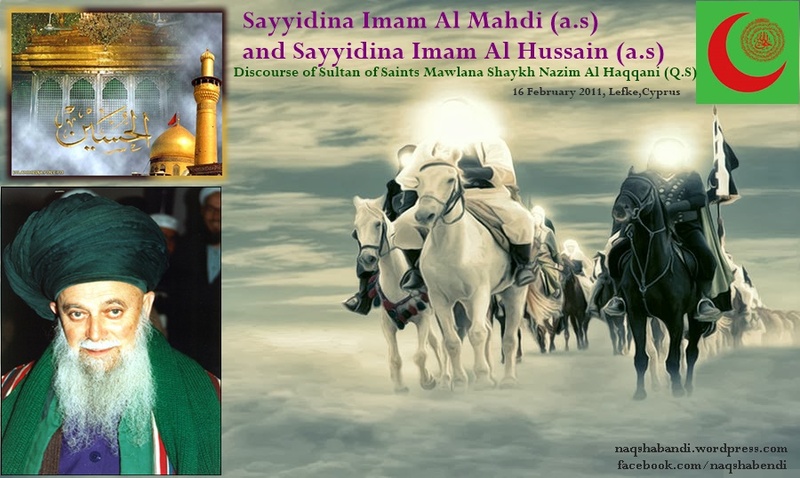 They say Sayyidina Al Mahdi (A.S) one division all on horses, and when Sahib Al Zaman (Imam Mahdi A.S), making his horses like this (Mawlan Showing with his hands to command horses to move), enough!,no need like this (like the ordinary horse moving) and behind him 12000 chosen ones. If looking such a looking that person may fall down dead!.. Everything over technology , technology under the feet of his horse,finish!. Ya Rabbi (O our Lord), we are asking , to reach those holy days when no prophet ever given such an authority, except for Imam Al Mahdi (A.S) to clean this world, not to leave anyone against Islam (Submission to Allah Almighty, Law Breakers , those who practice lawlessness ,those who deny the Laws and Commandments of Allah) They are coming down (on their horses from the sky). Any place that they are landing only making horse like this, one minute, up, one minute,down, (Mawlana Shaykh showing how quickly the Horsemen of Mahdi alaihissalam can reach around the world) , screaming. They are shouting If anyone hearing, they should say thunder, thundering. Hearing thunder, but no clouds.. How thundering?. Their swords… lightening…finish. Miraculous powers granted to him, to use it. Rasoolullah (Nabi Muhammad alaihiswalathu wa salam) never used that power. He (Nabi Muhammad alaihiswalathu wa salam) left it for Sayyidina Al-Mahdi (A.S). This is coming, this is coming..”wa Khaba Kullu Jabbarin ‘Aniyd” (Sura Ibrahim, 14:15) Everyone who claiming that, he is the first,he is the best, he is most powerful,their heads like this , thrown away. Weak ones,poor ones, weak people with him. Tyrants, Allah Allah! Allah! Defend, defending believers, if they are not believing they are taken away also. Those people all of them passed away,their homes, their castles. What we shall do…?. I am looking which one should be for “Sahibu Zaman, the owner of time (Mahdi alaihissalam). That night building for “Sahibul Asr”, a castle, not palace,castle…If whole mankind trying to make such a castle, they can’t do. And Mahdi (alaihissalam), Sahib Al Zaman, “Owner of time”, like this (Mawlana showing with hand how Mahdi ascend) with his sword on… between the skies and earth; now people they are not interested in such things, all of them, they are occupied for dunya (materialistic world) and for themselves. And dunya (this world)saying: “I am not with anyone. I am here, But you are going. Don’t try to reach to me,or everything on me”. No!..But try to be the last day from those people whom they should be called paradise people, may come for entering , Jannatun Aliyat /high station in paradise….in the paradise of Firdaus. Enter, Allah…Jalla Jalaluhu, Jallatu hu. We are not patient people. We are asking for everything quickly, We are weak ones and those tyrants making ‘Zulum’-injustice . They should not oppress any people also We are waiting who can take the hand of believers, Muslims, Ummat Muhammad (the Nation of Nabi Muhammad, peace and blessings of Allah be upon him and his family) to take them away, to save them, and to destroy everything from Kufr (disbelief). Sayyidina Imam Al Hussain (A.S) the event of Karbala/ Karb (deep sadness) , Bala’ (evil) he came, he is coming there. When he is coming the order will stop!. Now leave what is happening for us, because here, with holy family , and coming a group of people fidaiyun/martyrs… fidaiyun they are sacrificing themselves. Coming Yazid’s armies. I am saying, what do you think?. The grandson of the Prophet (alaihiswalathu wa salam) was to be slaughtered? Do you think that he was…. slaughtered? . 70 kings of Jinns, they were in full readiness to attack. But his appearance was brought and this was slaughtered!. Allah Almighty, trying His servants. And he was taken,to his Grandather’s Maqam (station). There are so many things that no one knowing now, no one. Jinns, Jinny.., for what coming there?. To be making show?, for show? Rabbuna (Jalla wa Ala) ….Hasha! But “Wa lakin Shubbiha Lahum” (Sura Nisa 4:157)That is holy Quran..Ayathil Karima. (The ayat explains, like in the life of Jesus Christ Peace be upon him, which lead to a new faith in later) They were thinking that they slaughtered him (Imam Hussain, which lead to a sect to be emerged in Islam as Shia, based on the doctrine of Imam Hussain’s Martyrdom)!.. As they are thinking that they caught Jesus Christ (A.S) and making on cross,… never happened. One he was dressed, looking like Sayyidina Isa/Our master Jesus, juts looking Sayyina Imam Al Hussain (A.S). Never touching anyone…Hasha!….hasha thumma kallaa…. But people must cry for him. Must cry for Sayyidina Imam Al Hussain (alaihissalam). Everyone crying for him. Also, he is going to make intercession for everyone. He is not asking to make divisions of Ummah, No…Such a secret event, that Awliya Allah (Saints and Friends of God) also,they were ready for that. ready there in that place. No one is speaking..
now but it is over. Therefore, something from ocean , one drop, we can speak, no more. And he (a.s) with his Grandfather, Nabi Muhammad (alaihiswalathu wa salam). .Insha Allah we hope that everything that we are doing is for Allah, not for dunya (this world) Who making any action without thinking, without knowing, they are just taken away..Taken away. And closed that event from Karbala Thousands and thousands of people writing about Karbala. If they are looking from out side,they can’t look inside. Insha Allah, you should be happy with Sayyidina Al Mahdi (A.S). And you must make dua for a weak servant that for 70 years I am looking, I am making,.with to be saluting when he comes. 70 years, that I heard about Imam Mahdi (A.S), Qalbi/my heart just taken and putting in it , his love and his service…For…every century some people they have been granted that authority to meet him (Mahdi a.s) alayhissalam, alaihissalam. Ala Nabiyyina alaihiswalathu wa salam (Peace and blessings be upon our Prophet) . Thousands and thousands of Salawat and Salams (Blessings and Peace) on the Beloved of Allah. The purest descendant of the Prophet Muhammad (Swalla Allahu alaihi wa sallam), Sayyidina Imam Al Hussain (Radiyallahu Anhu wa alahissalam) Ya Rabbi. Let them be intercessors for us. On the day of resurrection to be our savior for us. Fatiha (Recite Sura Fatiha, Quran chapter 1), enough. FOOT NOTE: Whoever say: “We don’t follow Imams, we follow only Quran, only Hadith, only Quran and Hadith”, and so on, such false claimants will perish as the people of Jahiliya (pre-Islamic period), before the coming of Imam Mahdi (a.s), Imam Mahdi (a.s) is one of the highest Imam and from the Ahlul Bayth, he is to be followed (see Quran 4:59). So don’t get fooled by sects that preach false doctrines , stay firm in the congregations (Tariqahs) of the Friends of God (Awliya Allah). Previous Post Imam Mahdi (A.S) is coming! Next Post Why following the people of Tasawwuf (Sufism) is Obligatory?